Lowrance Ice Transducer 200KHz With Blue Connector. Works with:HDS-5, HDS-5x, LMS-332C, LMS-520C, X102C, X-510C Lowrance Portable-mount, 20-degree ice fishing type (200 kHz). (7 ft cable). Part # 000-0106-94. I try to describe the best of my knowledge but. In good used conditions. Tested and working. See pictures for details. Unit only. Just plug it in and fish, it's that easy. Trails 7 trails (4,000 max. trail points). Alarms Shallow, Fish, Depth. Easy front-dash or quick-release bracket mounting installation. Model: 000-14014-001. Just plug it in and fish, it's that easy. Lowrance Hook2-5x Splitshot. Hook2-5x Splitshot. SplitShot Transom mount bracket. SplitShot 2-in-1 Sonar with High CHIRP and DownScan Imaging. Model: 000-14016-001. 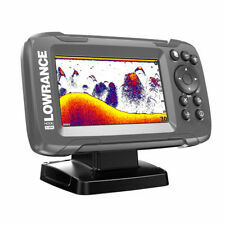 The item is Lowrance iFinder H2O with black & white screen. Model iFINDER H2O. What you will get: Lowrance Ifinder H2O 1. WAAS Features WAAS enabled. System Type Handheld. Usage Outdoor. Scratches could be seen on surface. Lowrance Elite 7 Ti2 Combo Fish Finder Chartplotter with HDI Transducer & US Canada Nav Chart. Includes HDI transducer with Lowrance® CHIRP and DownScan Imaging™. HDI Transducer. Transducer Type - 9-pin Connection, with optional 9-pin to 7-pin adapter; Multiple Selections Lowrance® and Airmar®. Fits all 2004 and newer Lowrance 200 kHz sonar units with blue connectors. 20' cable. LOWRANCE HST-WSBL 200KHZ T/M USE FOR 83/200 HDS. Transducer Type 9-pin Connection, with optional 9-pin to 7-pin adapter; Multiple Selections Lowrance® and Airmar®. Elite-7 Ti² Combo with Active Imaging 3-in-1 Transom Mount Transducer & US Inland Chart. Lowrance TripleShot 3-in-1 sonar with High CHIRP, SideScan, and DownScan Imaging. NEW in Original Box. Double the CHIRP sonar coverage of most fish finders. Easy to find fish with double the sonar coverage of traditional fishfinders. Gimbal Bracket and Knobs for 9" Lowrance units. Gimbal Mounting Bracket f/HDS-9 Gen2 Touch/HDS Gen3/HDS Carbon/Elite-Ti/Hook/Elite-Chirp. LOWRANCE PTI-WSU PORTABLE MT 20 DEGREE ICE FISHING 200KHZ. Portable-mount, 20 degree ice fishing type (200 kHz). Includes power cable. (7 ft cable). List of Related Accessories 99-91|ANGLE FINDER. Condition is New. With The New Elite Ti, You Get More Advanced Fishfinding Features And Connectivity, Without The Premium Price. With New Smartphone Notification Capability Built Into Elite Ti, You Can Keep Your Eyes On The Fish And Never Miss Another Text Or Call; Or Turn Off Notifications For Uninterrupted Fishing. More fishing tour pros use HDS than all other fishfinder models combined. That’s no accident. At the core of HDS LIVE is its powerful arsenal of sonar functionality. Featuring a high-resolution SolarMAX™ HD screen, HDS LIVE 7 provides industry-leading images that are always easy to see – from any angle, in direct sunlight or even through polarized sunglasses. Features 3D map display, MP3 song capable, aux output, 12 channel connection, brightness adjust and more! Used in great condition, tested! 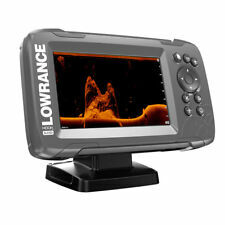 LOWRANCE® ELITE 9x CHIRP FISHFINDER •Combines the benefits of CHIRP Sonar w/DownScan Imaging?. Helpful Links. INTERNATIONAL ORDERS. Our main office location is in New York, NY. Our warehouse facility is located all across the country. Mounting bracket for LSS-2 StructureScan HD transducer. Stainless Steel. Gimbal Bracket for HDS-5 Units. HOOK2 9" Suncover, MFG# 000-14176-001. 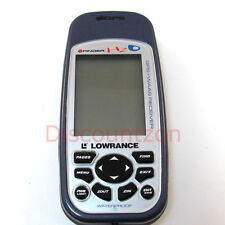 Lowrance iWay 250c automotive GPS complete 125-03. Lowrance's transducer mounting systems for sit-on-top fishing kayaks. Kayak Scupper Transducer Mount. Sun Cover f/Mark and Elite 4 Series, and also the Elite-3x Series. Lowrance Flush Mount Kit for the Elite-4 Series for NON HDI Series. Flush Mount Kit. Power cable for all HDS units: HDS-10, HDS-10m, HDS-5, HDS-5m, HDS-5x, HDS-7, HDS-7m, HDS-8, HDS-8m, Elite-7 Hdi Series. Gimbal Bracket and knobs for HDS-7 units (HDS-7, HDS-7m) NON TOUCH. Works with: Lowrance Elite-5, Elite-5m, Elite-5x, Mark-5x, Mark-5x Pro, Simrad go5. Bracket for Mark-5 and Elite-5 models. Transducer adapter, MFG# 000-13313-001, connects transducer with blue 7 pin plug to unit that uses black 9 pin plug. Flush Mount Kit for HDS units. NOT for use with HDS Touch. Adapter cable, 7 pin BLUE to bare wires.